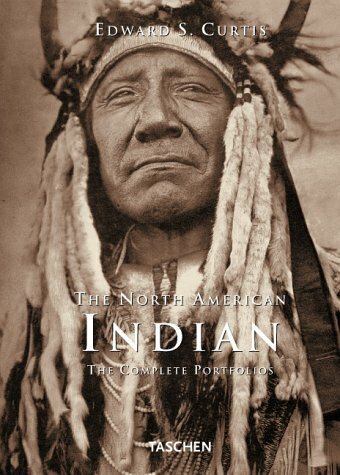 A unique pictorial record of more than 80 America Indian tribes: 'The passing of every old man or woman means the passing of some tradition, some knowledge of sacred rites possessed by no other; consequently the information that is to be gathered, for the benefit of future generations, respecting the mode of life of one of the great races of mankind, must be collected at once or the opportunity will be lost for all time.' At the turn of the century the American photographer Edward Sheriff Curtis (1868-1952) started on his thirty year project to produce a monumental study of North American Indians. Using an approach that was both artistically and scientifically ambitious he recorded, in words and pictures, the traces of the traditional Indian way of life that was already beginning to die out. With tireless personal commitment Curtis visited American Indian tribes from the Mexican border to the Bering Straits, gaining their confidence by his patience and sensitivity. This, his photographic life's work, was printed in 20 volumes between 1907 and 1930 as The North American Indian. The quality of reproduction of the photographs was excellent. There were only 272 copies in total. Now all his photographs are fully reproduced in this one book, together with a selection of pictures from Curtis' texts. Originally used to illustrate a 20-volume encyclopedia of Native American history and culture, these photographs from the first decades of the 20th century are a valuable document of history. From a striking 1905 portrait of Geronimo to the seal-hunting Eskimos of Nunivak Island, Edward S. Curtis's pictures reflect the diversity of cultures that existed among the various Indian tribes. Their quality is superb--Curtis used the then-state-of-the-art photogravure process to reproduce his images--and the 1906 critique from Theodore Roosevelt remains valid: "In Mr. Curtis we have both an artist and a trained observer ... whose work has far more than mere accuracy, because it is truthful."